With a beautiful landscape to explore, and a wonderful variety of local attractions, it’s easy to see why our family campsites in Normandy are so popular. Explore mile upon mile of coastline, discovering high cliffs, quaint fishing ports and stretches of golden sand. Inland, you will find magnificent forests, tranquil streams and fruit orchards. Camping in Normandy is the perfect way to experience this diverse region and a short break is a great way to discover its history and culture. 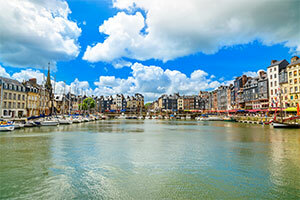 With so many sites to visit when you’re camping in Normandy, history is all around you: from the Normandy landings, to the legacy of William the Conqueror. Canvas Holidays has hand picked the very best campsites in Normandy, with mobile homes and spacious tents and superb onsite facilities. D-Day Landing Beaches Visit the beaches where Allied forces landed in June 1944 during Operation Overlord, and the numerous memorials and museums in the area, such as the restored Canadian tank at Courseulles-sur-Mer, and the Utah Beach museum at Arromanche. Bayeux Bayeux was the first town to be liberated by the Allies and the Battle of Normandy Museum explains how events unfolded after the landings. The old centre of the town is a network of narrow streets and half-timbered buildings and is of course the home of the celebrated tapestry, a 70m long piece of linen depicting the events of the Norman Conquest and the Battle of Hastings. Caen The home town of William the Conqueror suffered badly during the Second World War: the Memorial of Caen is a museum dedicated to peace. The Musée des Beaux-Arts is an impressive art gallery in the grounds of the Chateau Ducal, which along with the Abbaye aux Dames and the Abbaye aux Hommes was built by William and his wife Mathilda. La Cite de la Mer Discover the history of the ocean depths in this unique scientific, technological and cultural tourist attraction. Explore the world’s largest submarine open to the public and learn all about deep sea exploration. See Europe’s largest cylindrical aquarium and visit the exhibition dedicated to the Titanic and those who emigrated from Europe to the ‘New World’ of America. La Cite de la Mer is located minutes away from the Cherbourg ferry port and makes a perfect stop off either as you arrive in France, or before you catch your ferry home. Fécamp The main attraction at Fécamp is the Benedictine Palace, where the famous liqueur is made. Tour the distillery and cellars, enjoying a free tasting before you leave. For hundreds of years sailors left from Fécamp to fish for cod off Newfoundland, and their story is told a museum on the seafront. The collection of model boats is one of the highlights. Mont St Michel Explore this ancient site of pilgrimage and tour the Abbey buildings. Before you leave, buy some of Mère Poulard’s biscuits in their iconic tins before heading to the small town of Avranches to view the illuminated manuscripts in the interactive museum. Giverny The riverside village of Giverny was for many years home to the painter Claude Monet. His house and gardens with its Japanese bridge and pretty water garden are a work of art in themselves and are open to the public from April until the end of October. Falais Falais is the reputed birthplace of William the Conqueror, and one of the key sites of the Battle of Normandy. It’s also the home of one of the most charming visitor attractions in the region. Automates Avenue is a unique collection of 300 clockwork figures recreating the magic of the animated scenes once typical of Parisian department stores at Christmas time. To find your perfect campsite in Normandy please use our interactive site finder, call our knowledgeable customer advice team on 01 242 1901, or go straight to the individual campsite pages.